I am an accidental poet. I write screenplays to produce a dark sci-fi movie of love and despair. I keep an eye out for offensive content to prevent them from ever reaching you. I translate text to bridge language barriers for 800 million users. I am a patient, seasoned driver which you’ll soon be sharing the road with. I play an increasing bigger role in serving relevant results to you search on Google. We all know the story about how I defeated the world top Go player. And more and more people are talking about me. Who am I? You guessed it! I am Artificial Intelligence, and I am getting trendier by the day. As with all things trendy, the layers of hype wrapped around me by the media shield the public from knowing who I truly am, or more importantly, am not. If a machine could truly think and speak for itself, those would be the words that it would likely utter. The irony however is, in my view, it is immensely improbable. The vision of a machine that is capable of performing all those tasks above and to be self- and socially-aware is referred to as artificial general intelligence. It requires more than what current research can offer and it remains a long term goal of artificial intelligence. The recent successes we see in the media only highlighted our ability to build algorithms that solve increasingly complex, less well-defined problems. These programs however are incapable of extending beyond the bounds of the specific problems that they are designed to solve. The community calls them applied artificial intelligence, which we will refer to as just artificial intelligence for brevity. This will be the focus of this post. We will leave out of scope the long-standing debates around the attainability of artificial general intelligence. In this post, I will offer my view on what artificial intelligence is and is not, and what is driving the revival of interest in the field. A follow up post will be on the role that artificial intelligence plays in search. What artificial intelligence is and is not? Artificial intelligence are nothing more than computer programs that perform cognitive tasks that we often associate with the human mind. For example, a program that writes a poem or a screenplay is artificial intelligence, so is the ability to decide if a piece of content is offensive or relevant to your need, translate text to a different language or play a game of Go. The rise and fall and rise again of artificial intelligence. Search trend for the keywords “artificial intelligence” on Google between 2004-2016. Across these different areas, machines are artificially intelligent either through being prescribed how to do something or learn it from examples. The former is generally referred to as the symbolic approach. You can imagine artificial intelligence through this approach as a step-by-step guide on how to reason and solve a problem, and the knowledge required to achieve the task. The latter, which is known as the sub-symbolic approach, allows for the coders to be far less prescriptive. Instead, constrained data sets that contain examples of how something can be done are provided to algorithms to learn from. I love mangoes. I travel far and wide for good mangoes, from the Alphonso of India to the Carabao of the Phillipines. The issue faced by many people when attempting to bring some home from the market is navigating the cryptic decision making process of identifying the sweet ones from the less sweet ones. The most common variety of mangoes I ate growing up is Chokanan. It is light yellow in colour when ripe and for years, I associated this colour and its oblong shape with sweet mangoes. One day at the market, I started seeing a different variety called Harumanis . I tried applying what I know from experience. When I saw that all of the Harumanis mangoes in the crate have dark green skin, despite being quite similar in shape to the Chokanans, I was so sure that none of them were sweet. I bought some home and tried. I was wrong. I revised my knowledge of the characteristics of sweet mangoes. When I moved to Australia, I rarely see Chokanan or Harumanis anymore. I was exposed to new varieties that I have never seen before. I was unsure how what I have learnt in Malaysia would be of any use in Australia. 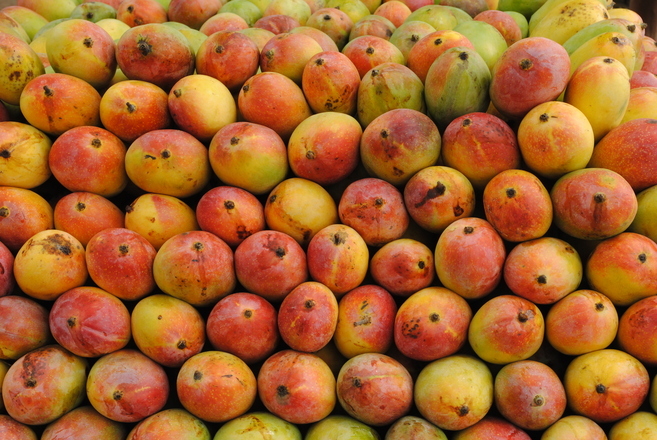 Most of the mangoes here are round and plump and the colours are deep yellow, orange and red. As you can see with the two snippets above, I have prescribed the knowledge required to problem solve this task of identifying mangoes as sweet or not as a sequence of logical statements. This is an example of the symbolic approach. On the other hand, the sub-symbolic approach, instead of having to derive the knowledge yourself, creates a table to describe the individual mangoes. The data set includes their physical characteristics such as colour, shape and country, known as features in machine learning terminology, together with the desired qualities or output variables. In our case, sweet or not sweet. These data are then fed to machine learning algorithms, for them to learn the nuances that link the average mangoes’ characteristics with their qualities, and produce a model to represent that. The next time you encounter another mango in the market, you only need to provide the computer program, which is armed with the trained model, with the traits and it will predict whether it is sweet or not. As you might have noticed by now, sub-symbolic approach which cover machine learning techniques are easier to scale up. For tasks where quality training data are in abundance, the sub-symbolic approach has less need for the knowledge upfront and shifts the understanding of the problem and the abstraction of the solution from the coders to the learning algorithms. On the flip side, the symbolic approach is more transparent. We can more easily trace the solutions back to the reasoning for explanation. Artificial intelligence research has gone through several cycles of high hopes and bitter disappointment  for the past six decades. We are now witnessing another rise in popularity, where machine learning leads the charge, or more specifically, deep learning. The advanced statistical techniques, which are loosely bundled under the deep learning umbrella have a history which traces back to the 1960s . In fact, the term “deep learning” itself was coined in the 1980s and re-introduced again to the community in 2000. Search trend for the keywords “deep learning” on Google between 2004-2016. What do you think contributed to the revival of deep learning techniques? The rise of deep learning is a major one, so much so that we are seeing a renewed interest in artificial intelligence as a whole. The two main contributors are the fall of the cost of computing and the rise of the availability very large data sets , both of which speaks to the practicality of machine learning techniques. In industries where computing cost and data availability are no longer an issue, deep learning has enabled great progress to be made, especially in key artificial intelligence areas such as speech recognition by Google and Baidu , and object recognition . The key thing that makes deep learning stands out from its predecessors is the ability to extract high level features from a given data set. This is often a very expensive exercise especially with large, noisy data sets, with its own field of research called feature engineering. Going back to our mango example, deep learning essentially provides a set of techniques to learn features from, for example images of mangoes, and make some initial guesses about the importance of the different features for prediction. In the case of the mangoes’ characteristics, feature learning may say that colour as a feature may be more predictive of sweetness than shape. These features and their importance, represented as weights, are then fed into machine learning algorithms for building a model. This may not sound like much, but when it comes to a problem area with noisy data set and a large number of features to deal with, it is kind of a big deal. The term artificial intelligence is making a comeback, and deep learning, a branch of machine learning, is the driving force. Artificial intelligence refers to the ability of computer programs to perform a task or solves a problem in a way which is typically attributed to humans. The statistical techniques and algorithms under the deep learning banner offers scalable solutions to the more immediate problems of artificial intelligence. Despite the hype that surrounds the topic, the current approaches to develop artificial intelligence, even with deep learning, do not equip machines with the ability to think and operate outside of the problems that they are designed to solve. In the next post, I will discuss the role that artificial intelligence, or more specifically, machine learning plays in search. Previous Entry Can’t We Just Talk?